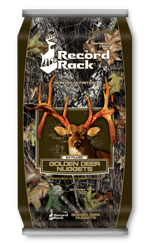 Record Rack Golden Deer Nuggets is specially designed to attract and nourish deer with a unique nutrition-packed formula. Ideal for replacing deer corn. Advanced extrusion technology for superior palatability, superior digestibility and superior water resistance. More protein for growth and antler development. More fat and fiber—and less starch and sugar—to aid digestion and help minimize the risk of digestive upsets in deer. Superior mineral and trace mineral package to support the development of structural tissues and antlers. Higher vitamin levels for enhanced immune system response during periods of stress from the environment and the rut. No waste or stopped-up feeders from corncobs and stalk trash. Durable nugget form for convenient spin feeding. Wild berry scent and flavoring for enhanced consumption and appeal. Aflatoxin safe for all wildlife, including quail and other gamebirds. Record Rack® Golden Deer Nuggets™ can be fed in many ways. Feed in spin cast feeders, troughs, by hand or on the ground. They are also a great addition to protein pellets as a starter ration to start deer on supplement programs. **If you are feeding in a spin cast feeder, use a 2” opening or wider to insure proper flow.